There was great excitement at No 14 next door. The long awaited parcel had finally arrived all the way from Amazonland in America somewhere. Hands trembling with anticipation and excitement, he impatiently pulled off the wrapping from the weighty parcel. Although secondhand, it had cost him a pretty penny. In fact, postage had cost more than the contents. A big smile lit his face. Hugging the contents to his chest, he disappeared into the Mancave. Since that day some four or five years ago, the book has been read and thumbed through countless times. Published in the early 1990’s, its jacket cover is now tatty but still in place to protect its precious contents. It is brought out for show and tell at the drop of a hat. He’s an armchair petrol head. My Irish neighbour. Particularly when it comes to motorcycle racing. Always has been. Back in the old home country in 1962 he went to the Isle of Man TT. That is where he met the legendary John Surtees and his siblings Norman and Dorothy. In my ignorance of anything to do with things racing on two wheels, I asked him the other day what TT stood for. He looked at me in utter amazement. It would seem, judging from his expression, everyone in the entire universe should know as a matter of course. It is knowledge ingested at the breast with mother’s milk. Well, I had to google it, didn’t I, given it’s integral to this story. It turns out TT stands for Tourist Trophy. An annual public road motorcycle sporting event, it has been held in May or June every year since 1907. Whilst visiting a few weeks after the arrival of the sacred artefact, he handed me a postcard. Taking it, I looked at it. Then looked at him questioningly. It was inside the John Surtees book, he said. Oh, I said. And tried to decipher the writing. Being vision challenged by then, it was not easy. In fact, it was pretty well nigh impossible, the writing was so scrawly and small. So we wondered and assumed all manner of things. Then it got tucked back into the precious book, a part of its history it would seem. Every now and then, the card is brought out again. It’s a curiosity. It’s provenance unknown. It raises questions. It titillates the imagination. I had tried to deciper the message a few times. I figured if I could read doctors’ scrawls, one postcard message should not be that hard. But several words kept eluding me. The year it was written proved to be a bit more tricky. But given the language used in the message I narrowed it down to 8.2.1984. Well, Mr Ruemmler’s name just had to be Michael! So, in a flash of brilliance, I typed in Michael Ruemmler, Kensington, USA and hit enter. OMG! I had cold shivers. The first thing that came up on screen was a Kathy Ruemmler, staff member/aide to Barrack Obama, White House. Images of our home being stormed by the CIA looking for the person who was searching the USA President’s staff flooded into my head. I closed the tab. But curiosity got the better of me. So I sneaked back in, narrowing the search using what additional information was on the address. And guess what ! There were several Michael Ruemmler’s listed. One or two were distinct possibilities of being the very one to whom this postcard was sent. However, a red WARNING sign flashed at the bottom of the screen and caught my eye. It said that if I proceeded with this search I may be confronted with disturbing and alarming information I may not want to see or know. It did reassure me though, that the person I was investigating would not be informed or know I was looking at their personal information. Well, that was comforting. Perhaps. Oh, and of course it would cost, depending on what sort of search I wanted to conduct. I started to feel like a sleazy private eye. So this time I hit the close tab. For good. And have ever since wondered how much about me is out there floating around for anyone to find. I have passed the information on to the armchair motorcycle racing enthusiast. 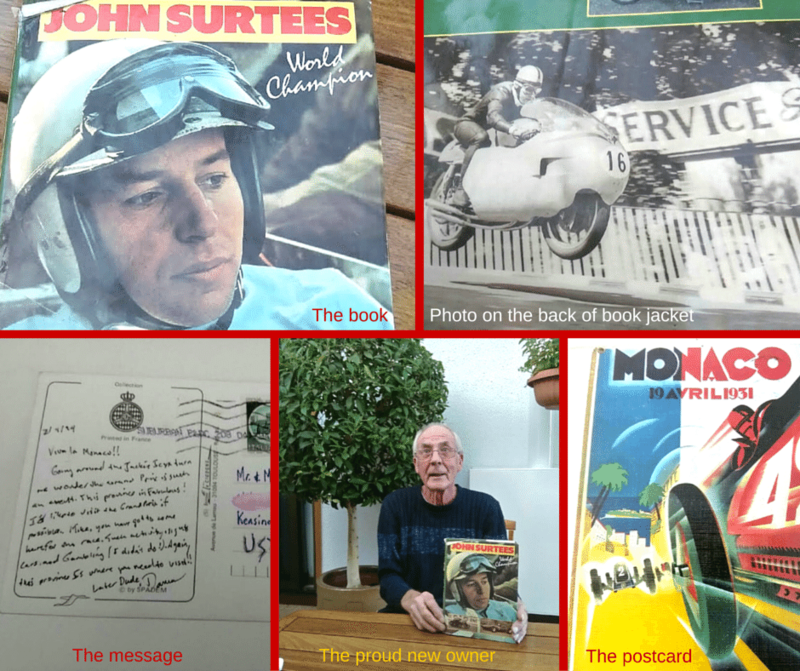 If anyone reading this post knows of a Michael Ruemmler who had a John Surtees book with a bookmark postcard from his friend Darren who sent it to him from Monaco back in 1982, just let him know that his book, and card, are now treasured possessions of an Irishman living in Adelaide , South Australia, who met the world champion at the Isle of Man TT back in 1962. And if he wants to know more, send him a copy of this post. I do wonder how those sleazy detectives feel when they snoop around people’s things. What a fabulous post, Raili!!! That is SO something I would do, too! I probably would have been just as obsessed to find information on it, too. If we don’t hear from you for a few days, should we assume that the CIA has confiscated your equipment? Sounds like your neighbor has a very special piece of memorabilia. I think it is very thoughtful of you to try to find out where it originated. Fascinating post, Raili.. oh the temptation to snoop and keep snooping.. glad you decided not to go further. No telling what you may have found, perhaps something that would have tainted the whole business with the post card and book for your neighbor. Ah well, here’s hoping that the CIA or some other nefarious organization doesn’t come knocking on your door! Cheers! Thanks Lori. I think I’m safe as they haven’t come looking yet ! !